Wolff-Parkinson-White syndrome (WPW) is a type of heart condition you are born with (congenital). It causes a rapid heart rate. If you have WPW, you may have episodes of palpitations or rapid heartbeats. WPW affects between 1 and 3 of every 1,000 people worldwide. Normally, electrical signals travel through your heart in an organized way to control your heartbeat. This allows blood to pass from the upper chambers of your heart (the atria) to the lower chambers (the ventricles), and then travel out to your body. 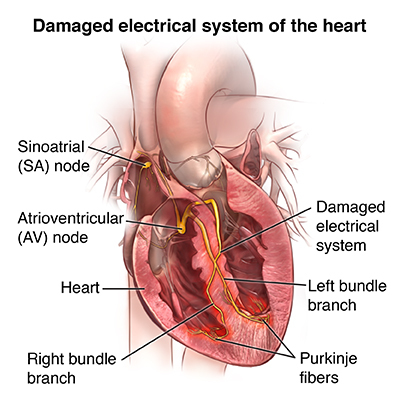 The upper and lower heart chambers are normally connected by a single main circuit in the center of the heart through which electricity flows. 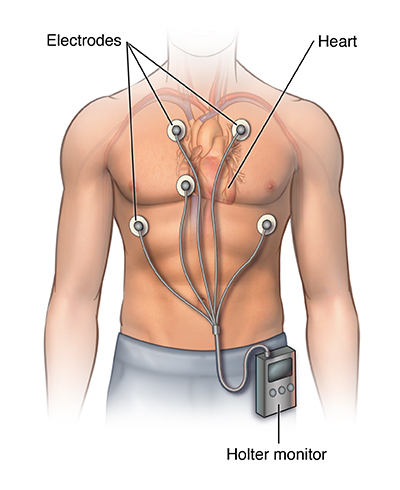 In WPW, there is an extra connection between the upper and lower chambers that causes a rapid heart rate (tachycardia). In WPW, the heart has an extra electrical pathway that causes a rapid heartbeat (tachycardia). If forms before birth as the heart is developing. It is unclear why the extra electrical pathway forms. It sometimes occurs with other congenital heart defects. A few people with WPW have a gene defect that it passed down through the family. Who is at risk for Wolff-Parkinson-White syndrome? WPW affects both men and women. In most cases, the cause of WPW isn’t known, but researchers have identified gene mutations that may be responsible for the disorder in a few people. How is Wolff-Parkinson-White syndrome diagnosed? You may be able to stop an episode of tachycardia by massaging your neck, coughing, or bearing down like you are having a bowel movement. This is called a Valsalva maneuver. You may be able to take medicine to stop or prevent tachycardia. But, there is no medicine that will cure this condition. If medicine and the Valsalva maneuver do not work, you may need to go to the hospital for cardioversion. This procedure restores your heartbeat to a normal rhythm, by passing an electric current through your chest into your heart. If you are having frequent or uncontrolled episodes of tachycardia, you may have a procedure called radiofrequency ablation. Your doctor threads a long, thin, flexible tube (catheter) through a vein in your groin to the heart. There, low-voltage, high-frequency electrical energy is used to destroy the abnormal connection. The treatment cures WPW about 95% of the time. What are the complications of Wolff-Parkinson-White syndrome? WPW is not a dangerous disease for most people. You can manage or correct the condition with treatment. Worrisome symptoms include fainting with very rapid heart rates. There is a very small risk of cardiac arrest if the heart rate becomes extremely rapid. This may be seen in people who also have atrial fibrillation (another type of arrhythmia). How can I manage Wolff-Parkinson-White syndrome? There is no way to prevent WPW, but you can prevent complications by learning as much as you can about the disease. Work closely with your cardiologist (healthcare provider who specializes in diseases of the heart) to find the best treatment. Ask him or her to teach you how to do a Valsalva maneuver. Tell your healthcare provider right away if you have symptoms of WPW. Wolff-Parkinson-White syndrome is a type of heart defect that you are born with. It causes rapid heart rate. Medicine can help control symptoms. Cardiac ablation can cure the disease in many cases. Consult with your healthcare provider right away if you have symptoms of Wolff-Parkinson-White syndrome.